John Anderson is a lifelong business strategist and entrepreneur. 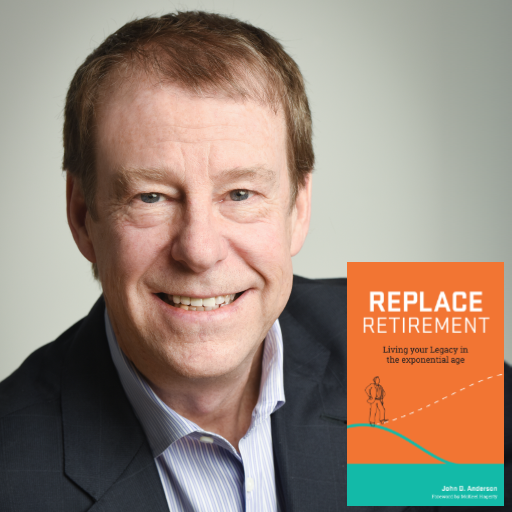 Through his recently published book Replace Retirement: Living Your Legacy in the Exponential Age, and in his coaching business Anderson shares his passion for living the second half of life better than the first half. For the past 20 years he has coached CEOs and executive teams in developing clear, measurable goals underpinned with structures and insights to achieve both professional and personal success. Anderson’s entrepreneurial spirit has guided much of his professional life starting in the office furniture industry where he built, then sold, a leading office furniture dealership. He was the first coach to work with Verne Harnish, during the time that Harnish developed Gazelles Inc., now considered one of the leading executive coaching organizations. Anderson is active in corporate speaking and coaching, and has equity in a variety of entrepreneurial companies including The CEO Advantage, Dogtopia, VizBe and Exponential Advisor. In the late 90’s John Anderson founded the Detroit Chapter of the Entrepreneurs Organization, was recognized by Michigan’s Future 50 award, “Today’s Workplace of Tomorrow” award, and in Crain’s list of Forty under Forty. He served on the Leadership Oakland board, the Oakland County Business Roundtable and is considered one of the most networked entrepreneurs in the region. Anderson started his career with IBM.